Mother of God: I would like to come to you with a message that is key to the understanding of My place in the world: I am a Mother. Through My higher motherhood, I have obtained the grace to intercede for you as a Mother. Today, I want to make you realize why I was called a Mother and what it means. I want to leave you messages, which will show Me to the world in a new light – as the Mother of humanity. I have already told you that My motherhood is a grace, which I have obtained by the Divine motherhood. Under its provision, I was gifted with the children of God, which My Heart conceived in pains, in order to beget them to a new life through the participation in the redemptive suffering of My Son. I have told you that I conceived in pain, because the grace of conception and of birth of all My children is contained in the secret of the Cross. In it and through it I have received My offspring. My offspring is the fruit of My virginity. Perfect virginity resulted in Divine fertility, bringing into the world the Son of God, and with Him the entire progeny of God. As far as My virginity was pure and self-denying, as extensive are its fruits. And so, the height of virginity brought the height of fertility, bringing Me perfect motherhood, otherwise saying – full motherhood. On this basis, I want to show to all of you that as much as I am truly the Mother of the Savior, in the same way I am truly your Mother, because I have received the grace of the Divine motherhood and the human motherhood under the same merits. Both these motherhoods are inseparable because by receiving Jesus under My Heart, I have received Him with all who belong to Him, and I became a Mother at the Father’s side, I became the Mother of all things. Christ is God. Being the Mother of God, I am the Mother of everything, because God is all there is. However, the motherhood about which I wish to speak is personal, most genuine inwardly and unique. By choosing Me for the Mother of his Son, God gave me a share in His Divine parenthood. He divided His paternity in two and made Me a Mother, remaining Himself the plenitude of fatherhood. Yet, I want to show you that if I was gifted with participation in the parenthood with which God has endowed his Son, how much more assuredly I was gifted with parenthood in the human sense towards the entire offspring of God. The Son of God is the pinnacle of grace, which God has given to Me. The children of God are My children by virtue of this first grace, which I have received. Human motherhood is contained in the Divine motherhood. Mother of God: My message relates to My maternal care for you. I want everyone to understand that I am your true Mother, because God has made me a Mother. I am a Mother. This is My first name – Mother. I stand in front of you as a Mother, and I want to be known as a Mother. A mother’s love can not be compared to any other love. It is unique, pure, and invincible. Can it ever surrender? Can it give up on love? Being a mother means to embrace love and live for love. Each mother will understand my words and everyone who has known the love of a mother – will understand. I chose love, embraced love and live for love. Out of love, I accepted all my children into my heart, although I experienced the pain that will be caused by their death. Today I come to tell you about Myself as a Mother. I want you to understand that I am not different from other mothers. Like all mothers, I desire to be close to My children, I desire to protect them, comfort them, and instruct them so they may avoid the misfortunes and dangers, which the world is if full of. And like every mother, I desire their love. Do I remember the pain that they inflicted upon me? No, I do not remember. Will a mother reproach her child the pain of childbirth? Not at all. I also do not remember your sins when you confess them in the sacrament of penance. Do not be afraid to come to Me because of your sins. I do not remember them. I love. I love you even more, because I know how much it came to Me to suffer for your existence. I accept the life of every person as a miracle of a new conception and a new birth. I will never say: I already have enough children. I desire each one of you and I love each one of you. My maternal love is simple. If you do not know how to talk to Me, talk to Me as if you would talk to your own mother or in the way you would want to talk to her. My Daughter, My maternal care for the world is of great importance, because as a Mother I always shield My children from even well-deserved punishment. I will never oppose the Will of God, but also I will never stop interceding for you. There is still hope. I ask you for improvement. If the world believes that I am its Mother and wishes to hide in My maternal arms, it will find salvation. The danger lies in the fact that mankind does not ask for its Mother’s help. Countless souls flee from under My care and I can not stop them. Countless souls do not believe that I love them and I am their Mother. Countless souls believe that they are indifferent to Me, that they are too impure to receive my care. They are unable to love Me, because they are afraid that once they take My hand, they will be unable to let it go. But I just want to restrain them from jumping into the abyss. Believe me. If you believe in My love, you will believe that I yearn for your peace and happiness. If you believe in this, then you will be able to trust Me, and when you trust Me, you will go where I go, everywhere after Me, and so straight to Heaven. Do never allow yourself to doubt my love. Celebrate Me above anything else. Does anything count for a mother above her children? A mother is able to devote her last forces to save her child. I live for you. My Heart is torn between love wishing for mercy and love wishing for justice. My daughter, yes, I live for God, but God created Me for you. Would there be a need for Redemption, if a man tainted by sin did not have to exist? Mother of God: I spoke yesterday about My motherly love. I will tell you however why man has ceased to believe that he has a Mother in Heaven. First of all, he ceased to believe in Heaven, in Hell and in the eternal reality. Today, all the attention of man is focused on meeting the needs of the moment, not on eternity which starts only after his death. I am a Mother forever and I belong to the world of the spirit. Deceived by the delusion of temporal things, you do not seek to build eternal things. The bond with Me is a spiritual reality. I’m the Mother of your souls, not of your bodies. However, your souls are drowned out by your bodies. You do not recognize Me anymore. Only when God himself will remove the husks from your eyes, you can recognize me, and feel how much you desire Me as a Mother. I hold your souls close to My Heart. I hug them all in My maternal womb. Children, you must understand that your souls are not alone; they have a Mother that constantly intercedes for them. I’m talking about your souls because only they are able to perceive Me and love Me, and only they are truly significant. Remember that the Mother, which God gave to you, is the same Mother, which He has chosen for himself. By giving you the same which He has gifted to himself, He makes you His brothers and exalts you. In this mystery you can see the humility and the love of God, who keeps nothing for himself, but wants to share everything with you. My child, do not be afraid. Everything that you write comes directly from Me, from your Mother. If you could see the human soul, it is an accurate reflection of the thoughts and the life that one leads. Each day is reflected on the the soul and makes it beautiful or repulsive. It all depends only on you. If you want to be like Me and feel My care more deeply, you need to become more spiritual, more dedicated to prayer and thought, rather than the contemplation of this world. As a spiritual Mother, I am pushed away by your sins. The more pure your souls are, the closer I am to you. 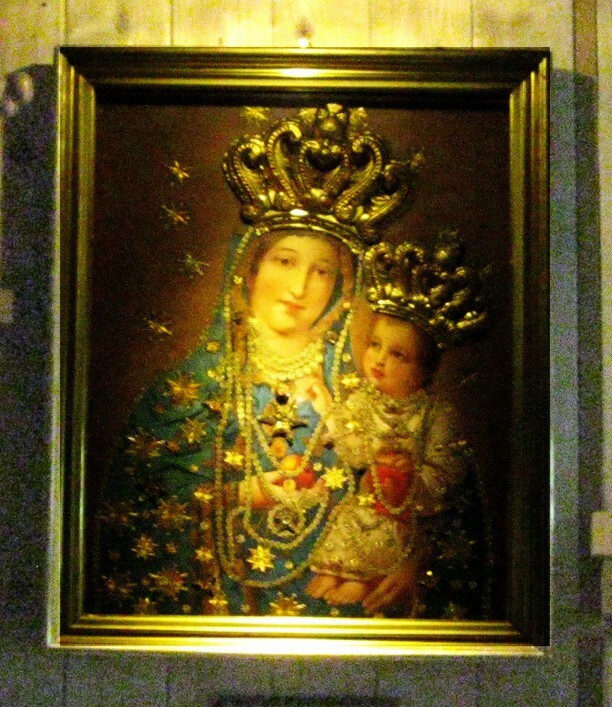 Explanation of the symbolism of Marian apparitions in San Sebastian de Garabandal (Spain). Mother of God: Let me tell you about My call, which has not been understood. I am a Mother always. I am a Mother especially in the moments when you need help. I desire that in times of uncertainty, difficulties, confusion or danger, you call upon me Me for help. As a Mother, I always come when called by a child in need. I am also a Mother in the middle of the night. The one that watches over the cradle, and when she hears crying, runs over to soothe the child. Especially at night, when the world appears evil and unfriendly, I am with you through My maternal care. I wish to show you that no matter what is going on around you, no matter how very dark and how very dangerous it is, as long as you follow My voice, nothing bad will happen to you. Each one of My interventions in the world brings you clues and answers to the questions that are troubling you. Garabandal is your map for these times. I show you how you should live, in order to find Me in the turmoil of this age and not lose faith. I ask you for a complete trust in My motherly love and care for you. If I am leading you, and if you believe that this is the case, you do not have to fear neither darkness nor a difficult road, or the dangers that are waiting for you. No storm can separate you from Me, because I am a Mother to you, and the more dangerous it becomes around you, the more you will feel My presence. Your falls do not matter, because if you truly listen to My voice, you still fall into My arms, and I tenderly lift you up. I am present on your journey, I am present in your families, I live with you and accompany you in your daily affairs. I do not want to be your Mother only on holidays. I want to be your Mother in your homes, in the midst of your ordinary, daily activities. I do not care as much for worship as for trust, so that I could care for you, staying always close to you. Therefore I ask that you always stay close to Me. My entire message is encompassed in the symbolism of life as a road. When you travel on this road with Me, listening to My call, you will overcome it quickly despite all the obstacles, not causing yourself any harm and promptly experiencing My consolation. Your life is a difficult road, full of inconveniences, full of a variety of snares and temptations. But if you go through it, calling upon Me in prayer, nothing bad will happen to you. You will run over everything that will cause others to stumble. If your hearts are open to My voice, and your eyes fixed on Heaven, nothing will be difficult for you. You will not wander off, because you will surrender to My will and it is I who I will lead you. Your life should consist of stepping in full confidence, without wondering where God leads you and why He is doing so. You should always go where the grace of God leads you. Do not look for justifications of God’s Will. Also, do not look for understanding among people, for whom your road may appear to be a pointless tangle. God knows your path and He leads you. Remember always to trust, and never separate yourselves from Me. You should always go through your life with the rosary prayer on your lips, eyes fixed upon Heaven and its mysteries. You do not have to look at the ground, in order not to stumble. Falls are dangerous only for those who look at the ground, not for those who keep staring at Heaven. Follow Me with full confidence. I will always protect you, and although earthly laws will restrict you, do not care for them, because everything in this world happens according to God’s Will. If your trust is complete, the earth will surrender to you, because you will use it for higher purposes. You will step on it, only to bounce towards Heaven. You will easily defeat what will defeat others, and you will surpass everyone on the way to Me. I’m waiting for you all. I wish that you do not wait for my supernatural call, since I address it to you in a simple and straightforward way. Through each sign on Earth, through each vocation, I speak to each one of you. Through My graces given to chosen souls, I instruct all my children. So remember that, even though I call you in the darkness, even though danger lurks everywhere, it is sufficient to trust and you will always fulfil My will and serve as an example to others of how carefully I look after those who put their entire trust in Me, not caring for what is human, but looking only for help from Heaven. My words are finished for the time being. I no longer wish to speak about this subject. What I have told you is sufficient to understand and to draw graces from what has happened here. 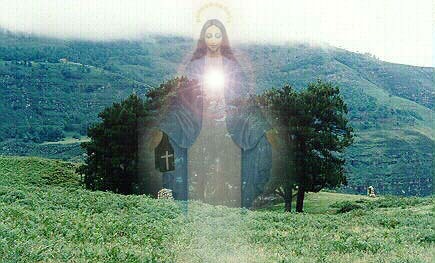 In every place on Earth where I come, I bring graces and blessings, as a Mother who returns to Her children from afar. I brought a lot of graces to Garabandal. If people had believed, they would have drawn on those graces. However, without faith, grace disappears and I have no one to give it to. Mankind must turn once again towards Garabandal to receive the grace of forgiveness. The rejection of these messages was a great loss for mankind. My daughter, the struggle which you are carrying on in Poland bears fruit at this place for the whole world. Mother of God: Write, My child. I’m here. My graces have been distributed amongst you. You will know them soon. But the most important is that my Message will be delivered once again to the world; and this is the biggest grace, because it brings forth conversion and the return with faith to God. My daughter, tell the priest that his zeal in putting straight what has been falsified about Garabandal will be rewarded. For me, as a Mother, the most important is that you benefit from My grace with which I come to this site of apparitions. However, it always depends solely and exclusively on the faith. You know very well that the whole Gospel testifies about the fact that miracles do not happen without faith. God is always waiting for faith to perform miracles, so the lack of miracles reflects a lack of faith. However, one should also remember that God performs many miracles which are not immediately visible, because they are spiritual miracles. I am very happy that My Message has been repeated and reminded to people. I myself have done so much already. I need helpers in testifying about the truth. Do not be afraid to tell the truth, even if it would cost you a lot. I have no time to lose, and above all your deeds and plans watches over the God Almighty, who burns with wrath against the sinful Earth, and softens seeing the faithfulness and love of the few who did not lose faith. The only thing that counts is how your actions and words present before Him. Do not pay attention to the opinion of the world, because the whole world is fleeting and you will not have to endure its judgements forever, but God’s judgements are eternal. Remember that your faith should be constant and sincere. The time comes for you to stand for the truth. You can not be afraid. You should choose in advance. Do you prefer to have on your side the opinion of the world, your friends, your family, the media and the opinion of the public, or rather the Will of God and the support of the entire Heaven. You have to make this choice now and you must not turn back from the path that leads to eternal glory. If you choose the glory of God, on Earth you will be defeated. However, this is only an apparent defeat. All this will change when the Truth will be revealed to the world. Remember, right now you can bear witness to the truth and fight for it. Later, it will be too late. Use every moment to prove to God your unshakable faithfulness and loyalty. Faith must be in the first place. Always. The Holy Spirit is at work in the soul which desires Him and always indicates the safe way. Follow Him. Listen to Him and close your ears to the lies and the discourse of the world. Do not drink the deadly beverage saying: ‘it will not harm us, because we feed on the Truth’. Yes, but by drinking poison, you do put God to the test. Therefore, I repeat to you: do not listen to those who lie and remain faithful to the truth revealed to you. Now, I bless you all in the name of the Father and of the Son and of the Holy Spirit. Mother of God: I would like that all people acknowledge the authority of My Son. I desire that they obey Him, but I’m also glad from those few who already believe and honour My Son now, before they will see the signs. I would like to tell you that the love, with which I embrace you, can not be contained in My Heart, and I always have to pour it out on mankind. I will not stop My love, but I will love you with the strength of a Mother who is waiting for her children. Yes, I am waiting for you in Heaven. I would like that all My children were already with me. Then, I would no longer have to be afraid for you. However, while you remain in the world, so much evil can happen to you and I can not for a moment let you out of My sight. In Heaven it is different. There are no more worries. There is only love. I do not have to fear for the loss of your souls. Only the joy of having children agreeable to My Heart remains for Me. My Son has gifted Me beyond measure; I want to fill this measure with My children, who will become holy. You have to understand that I would like you to resemble Me, so you may please My Son. Resemblance is acquired by imitation. Just like small children learn everything from their parents, in the same way you should look at Me and learn everything from Me. You will become like Me only if you will spend much time with Me, and in all the intricacies of your life, you will ask yourselves the question: ”What My Mother would have done? ” Proceed like Me, and you will become like Me. Staying with Me means to contemplate My life among the turmoil of your own lives. Then the turmoil will change into peace. At any time, you can use My motherly help and advice. I wish to be a Mother for you. Remember that where I am, there is also My Son. By submitting to My care, you will draw the blessing of God. Staying with Me – is looking at My image in your houses, – is asking for My opinion in difficult times, – is entrusting your life to Me and contemplating My life, in order to conform your own to it. The contemplation of My life is the rosary, in which is hidden My entire life in all its mysteries. Family life should be centred around Me and around my rosary. Then, it is out of the question for the family to fall apart. I am the Mother in these families, which worship Me as a Mother. What mother would allow for her children to fall? She is always close enough to protect them. Even if it happens that they fall, she will hurry right away to their rescue. So listen to what I ask of you. I would like to be in the heart of each home, in the place where you spent the most time, where you talk together, laugh and take important decisions. I would like that My image may to symbolize your bond with Me. Although hidden, my presence is certain there, where I am worshipped as a Mother. I will create a fire of love in the heart of every home, in which My image is placed where the whole family meets. This fire will not allow conjugal love to go out, will not allow for hatred and jealousy, will alleviate all disputes, and will fill you with peace. This fire of love is My Heart, in which I will protect you, teach you and lead you. This fire of love is lit and fuelled through prayer, mutual love and patient sacrifice. You should always gather around this fire, so your families may remain strong and joined by unbreakable bonds. Introduce My love in your relationships, and you will see what will happen. I will teach you to love. I will teach you to see one another through My eyes. I love you all very much and I want to be close to you, so I may help and support you in everything. Entrust to Me all your troubles. I will take care of them. I bless you My children.